You won't blow your vacation budget on dining surcharges on MSC Armonia for the simple reason that there are no specialty restaurants on the ship. Unsurprisingly, the ship serves an abundance of Italian food. Surprisingly, the Italian food -- and much of the food onboard -- is hit or miss. Even course by course in the main dining rooms, the quality can vary. 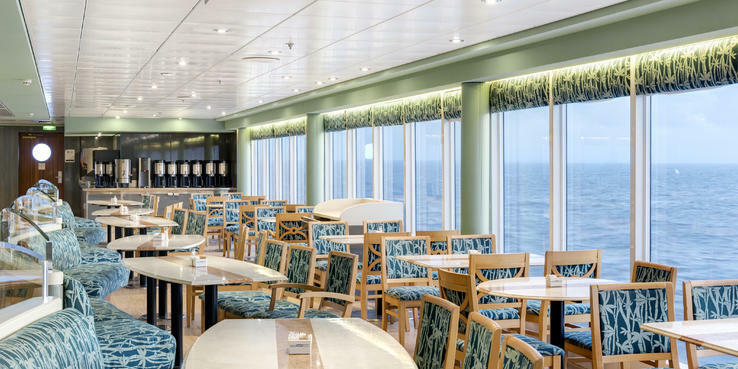 The casual buffet on Deck 11 provides an alternative to dinner in the main dining rooms, and when in doubt, the pizza served on the pool deck is consistently decent (avoid the rubbery hamburgers and hot dogs). Marco Polo (Deck 5): Marco Polo, seating 758 passengers, is the larger of the ship's two main dining rooms. It is decorated in mauve and pink with brass railings and a mix of carpet and marble tile flooring. Tables seat from two to six diners, and seating areas along the outside wall are a combination of built-in bench seating, normal table and chair setups and semicircular booths that seat six. The restaurant is open for breakfast, lunch and dinner. Breakfast and lunch are both waiter served and open seating, and run from 7 a.m. to 9:30 a.m. and noon to 2 p.m., respectively. For dinner, passengers dining in Marco Polo are allocated a set table and fixed dining times (early or late seatings are timed to coincide with the two evening shows in the Teatro La Fenice theater) at 6:15 p.m. and 8:45 p.m.
Breakfast offers eggs cooked to order, bacon, sausage, smoked salmon, cold cuts, cheese, fruit, yogurt, cereal, pastries, bread, tea, coffee, hot chocolate and fruit juices. There is a fruit station and an omelet station and both are buffet style, with omelets cooked to order. Lunch is a three-course menu made up of starters (soup, cheese croquettes, Greek salad), a main (typically steak, pasta and fish dishes -- hamburgers are always available), a daily special and desserts (such as fresh fruit, chocolate parfait, fruit tart or ice cream). Dinner can be as many as five courses and could include caprese salad (sliced mozzarella, tomato and basil leaves), a minestrone soup, chicken Parmesan, tiramisu and fresh fruit. Always available menu options in Marco Polo include Caesar salad (chicken optional), spaghetti Bolognese, grilled chicken breast, steak or salmon served with French fries, baked potatoes or the vegetable dish of the day. Vegan choices are also offered and most special diets can be catered for onboard, but the line advises notification of any special dietary needs when booking your cruise. Armonia carries pre-packaged gluten-free products such as snacks, cookies, croissants, sponge cakes and muffins. La Pergola (Deck 6): La Pergola, the second main dining room, is only open for dinner. Decorated in darker green and brown hues, this venue is smaller and has a much more intimate atmosphere than Marco Polo. The dining room offers the same menu and fixed dining times as Marco Polo, but only seats 358 passengers. Aurea Experience passengers have preferential access to La Pergola. La Brasserie (Deck 11): La Brasserie is Armonia's buffet cafeteria set up at the aft end of Deck 11. It holds just 320. La Brasserie serves breakfast, lunch and dinner, and stays open from 6 a.m. until 2 a.m. There's also a 24-hour coffee, tea and water station inside La Brasserie. For breakfast, the buffet offers both continental and cooked food, ranging from bread, pastries, cereals, fresh fruit, yogurt, cold cuts of meat and cheeses to bacon, sausages, scrambled and boiled eggs, tomatoes, beans and toast. In addition to the savory options, there are also sweet breakfast items like pancakes, waffles and crepes. Cooked breakfast is served from 6:30 a.m. until 10 a.m., and the cold dishes are available until noon. Lunch and dinner options include a salad bar, cold cuts, a carvery (for roasts), pasta and other hot dishes -- for example, curries or beef stroganoff -- along with fresh fruit, ice cream and a selection of cakes and other desserts. Lunch is served from noon until 3:30 p.m., and dinner runs from 7 p.m. until 10 p.m. Afternoon tea and its spread of sandwiches, cakes and pastries is served between 4 and 5 p.m., and there's a midnight buffet most nights serving snacks and sandwiches. Il Girasole (Deck 11): There's plenty of protected outdoor seating in Il Girasole, just forward from La Brasserie. This nicely situated spot serves up hamburgers, hot dogs, pizza, fruit and desserts buffet-style from noon to 5:30 p.m. and 7 to 10 p.m. and also has its own bar. Waiters patrol the area to serve drinks, but service can be very slow when the spot reaches its 450-passenger capacity. The only food options that cost extra on this ship are specialty items like ice cream and room service. Drinks -- other than water, juice and tea -- also cost extra, and MSC offers 10 different drinks packages for both children and adults. The package prices differ both based on which types of drinks you choose to include as well as based on the duration of your cruise. La Gelateria (Deck 11); a la carte: Everyone knows the Italian word for ice cream: gelato. La Gelateria is open from 10 a.m. to 6 p.m., and sells soft serve gelato ice cream in cups or cones for between €1.50and €3.50 and smoothies and other larger ice cream dishes (banana splits, for example) from €4 to €6. Vitamin Bar (Deck 11): The Vitamin Bar offers drinks made from fresh fruit and juices with the option to add additional vitamin boosters. Drinks run from €4 to €6, and the bar is open from 9 a.m. until 7 p.m.
Caffe San Marco (Deck 6): On the second level of the main lobby, Caffe San Marco serves extra-fee hot coffees, iced and frozen coffees and chocolate drinks from €1.50 to €4.50, as well as free biscotti and pastry items. Coffee packages are available at a cost of €23 for 21 coffees. Caffe San Marco also serves alcoholic drinks, such as Espresso Martinis (€6.70), and sometimes hosts live music. The cafe is open from 6:30 a.m. until 1 a.m.
Room Service: A complimentary continental breakfast with options like pastries, yogurt, cereal, fruit, toast, coffee and tea is available to all passengers between 7:30 a.m. and 10 a.m. Just fill out the menu card and place it on your outside door handle before 2 a.m.
For the rest of the day, a selection of food is available from room service at an additional cost. The menu includes soup, a club sandwich, caprese and nicoise salads, a cheese plate, a fruit plate and the dessert of the day. Prices range from €2.50 to €3.50 per item. Room service is available 24 hours a day.